I've been away for a couple weeks, but I'm back to share six sentences from Into the Fire, my short story with The Wild Rose Press. Here is a romantic moment after the reality show competition has wrapped. Hope you enjoy. 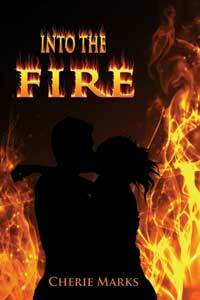 Her gaze hit his, and the pit of his stomach twisted as the heat melted him like butter on a hot roll. “I’ll take that.” He leaned forward and reached a hand under her ponytail to cup the back of her neck and pull her toward him as he lowered his lips to meet hers. The minute their mouths touched, he was in heaven. Great lead in to a hot kiss! Great six! I remember that scene... annnnnnd the pantry! Love the tension between these two. I'm hungry too. Posts should alert me to upcoming food references, so that I know when to look away. Very well conveyed emotion. Great six.